The Samsung Galaxy S II has sold in record numbers worldwide and millions of users must've cheered the news of the Android 4.0 Ice Cream Sandwich update rolling out. The latest OS from Google is a new lease of life for the Galaxy S II - but desserts are served at the end of the meal. It's an opportunity for the S II to finish with a flourish as it makes room for the much-anticipated new flagship. Ice Cream Sandwich, or ICS for short, improves the performance of the phone in some areas and promises better battery life - so, it's kind of like you're getting a free hardware upgrade. There's also a lot of new functionality that garnishes Ice Cream Sandwich, a lot of which is concentrated in the browser, but the general usability of the interface got a boost too with the latest from Google. 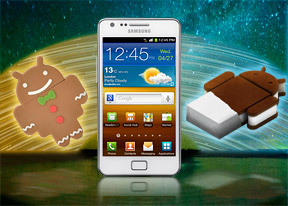 Here's a summary of what you can expect after updating your Samsung Galaxy S II to Android 4.0 Ice Cream Sandwich. Of course, the Galaxy S II interface is not purely Google-made - the phone runs the latest TouchWiz 4.0, but oftentimes you can't quite tell it's a new version of the software at all. Not that this is necessarily a bad thing. Anyway, we'll test the camera to see if Samsung have made any tweaks to the processing or upped the video bitrate or done anything to improve image quality. Get your taste buds ready and jump over to the next page where we try to find what Ice Cream Sandwich means for the general interface and functionality of the Samsung Galaxy S II.